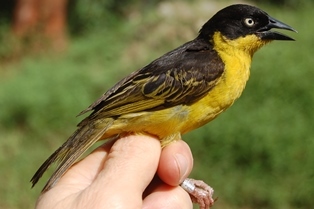 Today a Baglafecht Weaver was recaptured at the Nairobi Museum in Kenya. It had been ringed there as an adult on 12/04/2007, ie. 7y 10m 2d ago, thus it would be over 8 years old - see here. VD van Someren (1958, A bird watcher in Kenya) noted that a pair of Baglafecht Weavers in his garden reached an age of at least 7 years, probably unringed but individual birds that he got to know well. No other long records seem to be published for the Baglafecht Weaver. More weaver longevity records may be found here.